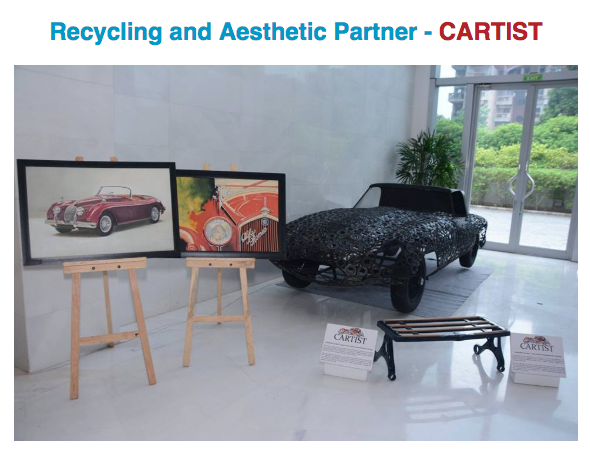 Auto Gurus, Mktg Gurus, Social Media Gurus powered Co-Creation of a Win-win Future of the Automotive! Movers & Shakers of the Auto Industry in the House ! 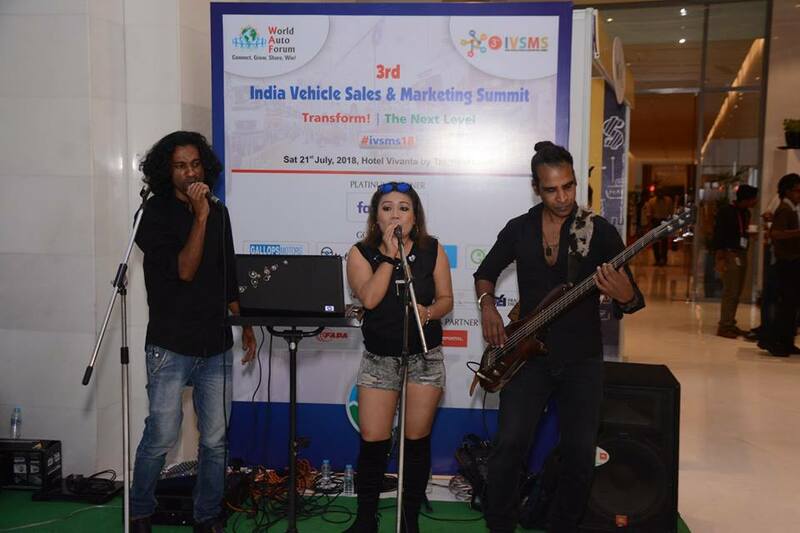 Black Slade, Rock Band from Goa! 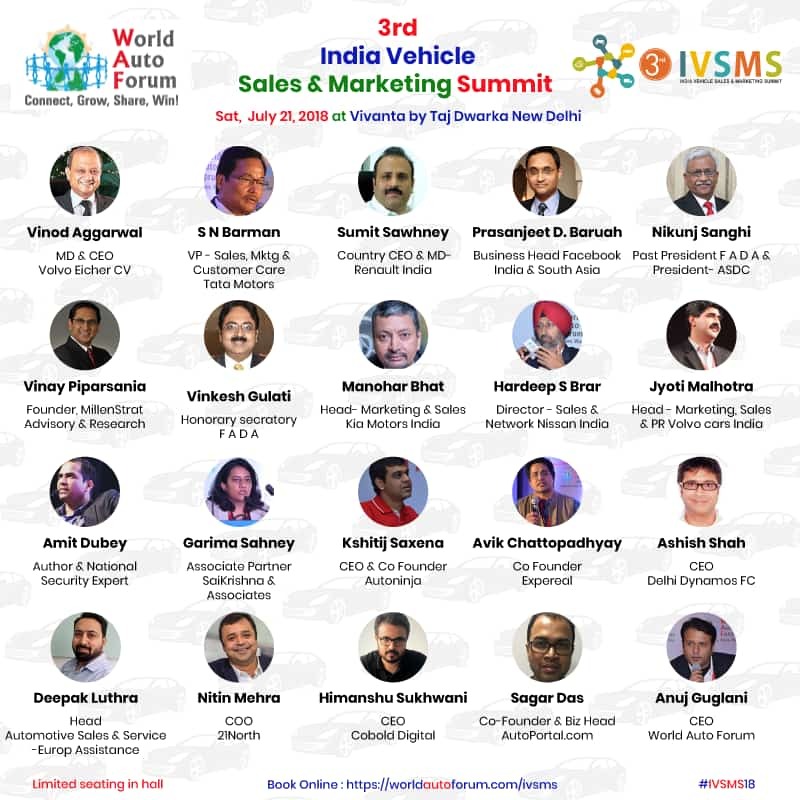 IVSMS Power Panel 4: Connected & Informed Customers: Equal Opportunity for Start up, Emerging & Cult Brands ? 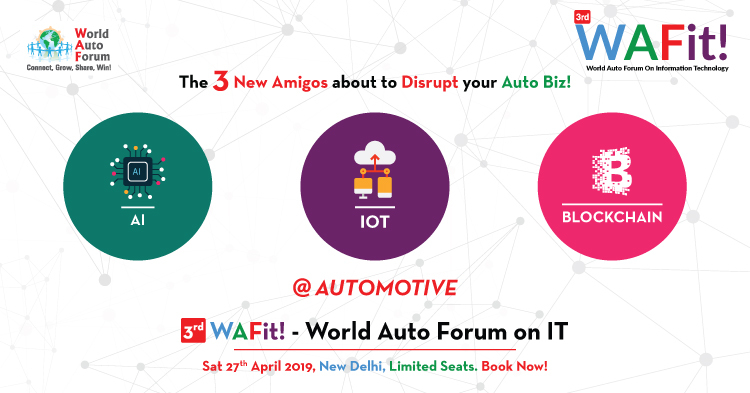 Organised by World Auto Forum, an organization that connects Auto industry across 125 countries, it is a unique event in their annual calendar which gets together the Automotive Sales & Mktg EcoSystem. 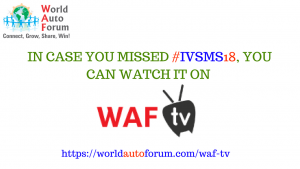 Anuj Guglani, CEO, World Auto Forum gave the welcome Keynote. He shared the importance of reducing dependency on Fossil Fuels for Electricity Generation & recycling of batteries, if we truly want a “Green EV Future”. He spoke how Connected Vehicles and Adhaar 2.0 ( Geotagging of All Road Infra) can substantially reduce Road fatalities. He also shared the importance of the theme of 3rd IVSMS : Transform! The Next Level. Vinod Aggarwal, MD & CEO Volvo Eicher Commercial Vehicles gave a remarkable presentation on how Consumers are adopting innovations in CV Space. He spoke about the several pioneering products, features and solutions in CV space by Volvo Eicher CV. He spoke how the consumers have adopted new concepts like overall cost of ownership, Product Uptime, Proactive Maintenance. He lauded the collaborative efforts of Suppliers, Dealers and Business Partners. He shared how his company is focussing on the CV Drivers Welfare, Safety and Comfort, who had seen years of neglect. Avik Chattopadhyay, Co-Founder, Expereal spoke about the lasting impressions and milestones of the Indian Automotive Industry. He mentioned, ”When in last twenty years, Interaction and interface of most products & services have changed, why should automotive be an exception? 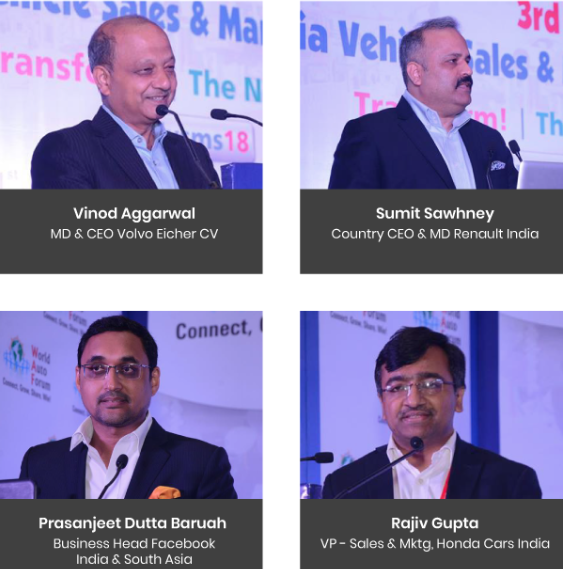 Auto Co’s have to be far more consumer driven, collaborative and co-creative.” Mr Chattopadhyay, an Industry veteran himself, did a stellar job in moderating two power panels powered by the Industry Movers and Shakers. 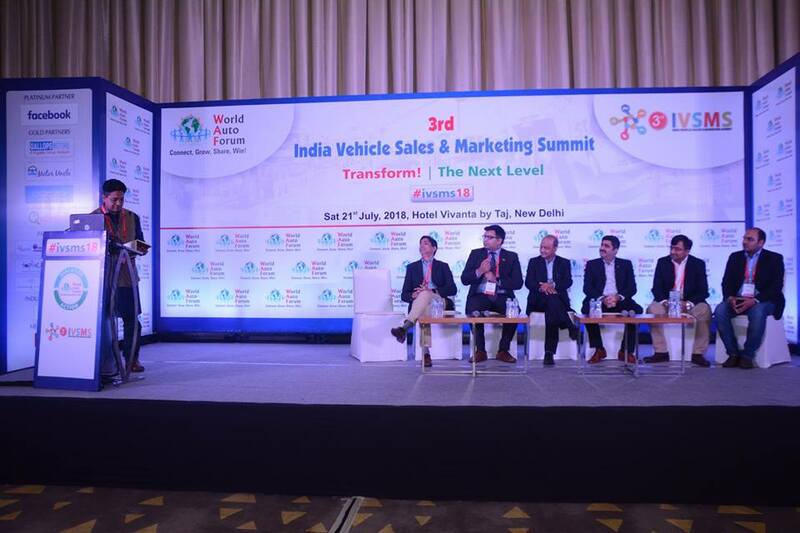 S N Barman VP Sales, Marketing, Customer Care Tata Motors PVBU spoke about the growth of the Industry last 20 years. The challenge of changing the dealer mindset from that of a Distributor to a Retailer ; Having Systems, Processes and Proper Organisation Structure in place. He spoke about the Big Confusion in selecting the best medium to find and engage customers. According to him, the challenge is to keep pace with fast rate of change. Sumit Sawhney, Country CEO & MD Renault India said Auto Retail is no more like riding a horse. It’s akin riding a chariot with 8 horses where each horse represents a different revenue stream. He spoke about managing the present, correcting the past and building the future. He said, Innovation is constant now. “Transformation is Transit Formation”. He spoke about the Huge Opportunities in the Automobile Industry, the India Growth Story and the Kwid Success Story. Nikunj Sanghi Past President F A D A and President ASDC said what if the dealer has the Best Infrastructure, Trained Manpower and the newly delivered vehicle breaks down after being driven just 5 Km from the showroom. There are lots of promises made by the OEM to the Dealer. The Latter’s concern being, “Is my investment protected?” He further mentioned the digital presence of the Dealer has to be far more than that of an OEM. “As an auto retailer, my showroom traffic & my response time to customer are my responsibility, said Mr Sanghi. 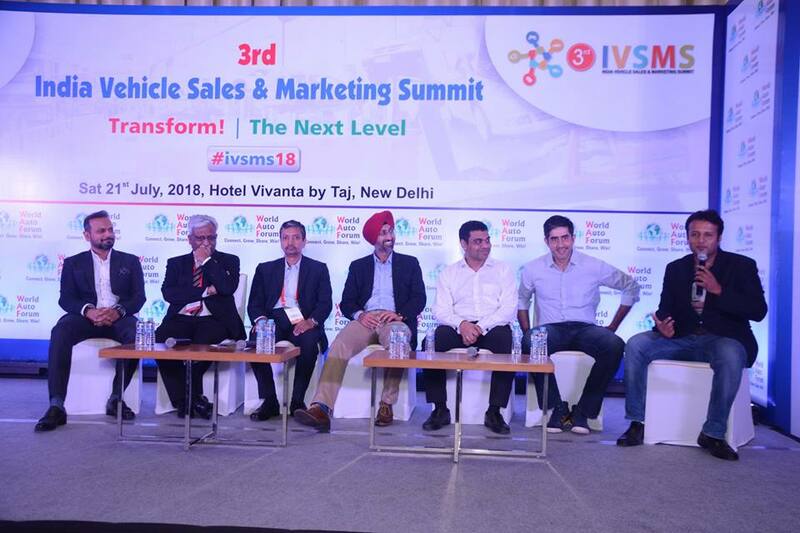 Vinkesh Gulati, Hony Secretary F A D A spoke about the challenges of running Successful Dealer Business and the concepts of Customer Lifetime Value, Customer Retention & Dealer Viability in Digital era. He shared how F A D A – Federation of Automobile Dealers Associations , founded in 1964 now represents 15,000 Auto Dealers with 25,000 Touch points and 5 Million employees at Member Dealerships. He spoke about the need of collaborative approach between OEM’s and Dealers especially as the the Next Gen in the Dealers Family need more space and say in the business. 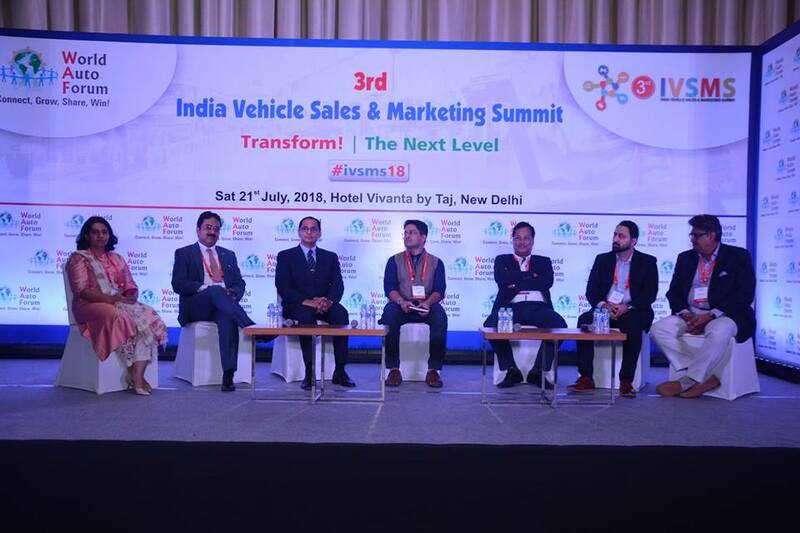 Manohar Bhat, Head Marketing & Sales Kia Motors India mentioned about the common & shared objective between Auto OEM and their dealer viz “Please the customer and make money.” He said the Basic Strategy and its implementation need to be sound for success. Having a good Dealership infrastructure is important and not that uncommon these days. However its maintenance is a bigger priority. Jyoti Malhotra, Head Sales, Marketing & PR- Volvo Cars India spoke how Premium Luxury is a niche segment and Volvo as a brand is niche within that Niche. He mentioned about staying connected to one’s roots. Doing what comes naturally. Safety is the DNA for Volvo. He spoke about Volvo’s Vision 2020: By Year 2020 no one should be killed or seriously injured in a new Volvo car. Whether its occupants & pedestrians safety, women’s safety, Dealer Safety Drills, all are natural extensions to the Safety DNA. Tanuj Pugalia CMD Gallops Motors spoke that a dealer is a trader, a facilitator. A Dealer is the custodian of the Customer Experience. He mentioned, the Brand Experience might vary dealer to dealer for an OEM but within his group, where he has 5 brands, the experience is almost the same. That’s the consistency and the promise of his Group, Gallops Motors. That’s what keeps the Customer Connect alive. Sanjeev Garg, Former Global Head Customer Care Tata Motors CVBU mentioned how most things have changed last twenty years except the noise in the system viz a Negative Word of Mouth. Just the medium of word of mouth has changed from face to face to digital. Many Mega brands entered the country with a big bang and are now nearly extinct due to the Noise in the system created by their dissatisfied customers. 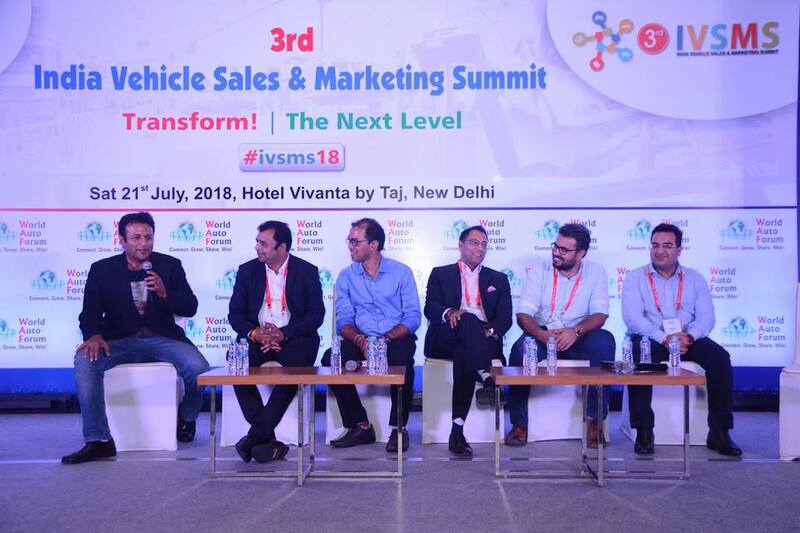 Rajiv Gupta, VP Sales & Marketing, Honda Cars India spoke very passionately about 10 paradoxes which the Automotive Sales & Mktg Professionals face. He wondered whether Cult Brands are built or they just happen. Even if one builds a cult brand, can it help sell too. How to reconcile Sales & Mktg Teams conflicts, how to harmonise Offer based advertising with Branding, Imagery & Lifestyle. 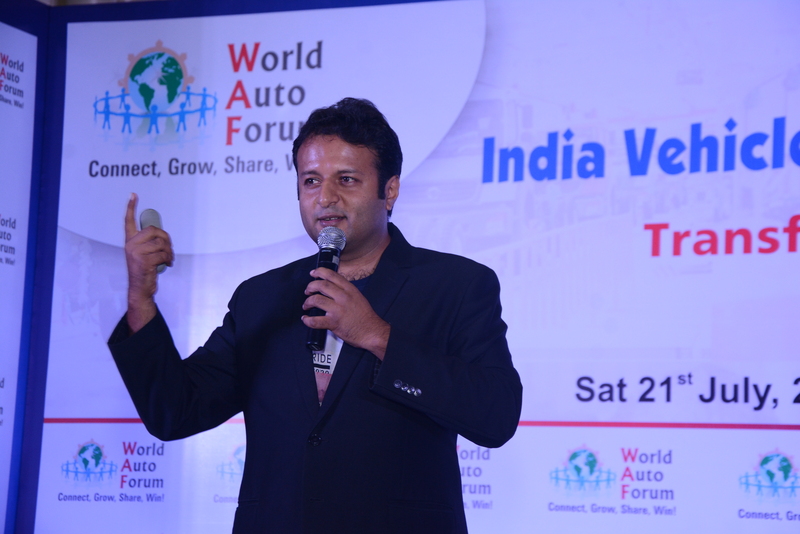 Vinay Piparsania, Founder Millenstrat Advisory & Research debated if auto brands can be ageless? He spoke about a few auto brands which don’t even exist now. Twenty Years back being offered and given a Test Drive was in itself a wow moment of truth. Customers are now finally empowered. They are the one really driving the business. We, as an industry, need to shun going purely by our forecasts and Product Life Cycles. Hardeep S Brar, Director Sales & Network Nissan India said every brand is a set of promises, every brand has an aura. These come together and form the genesis of customer expectations. According to him dealer infrastructure, dealer manpower and their training constitute top three pillars to make or break the auto brand. Gauraav Thakar, VP & CMO Quality Kiosk said that customer experiences used to be face to face and now are mostly digital. He spoke about the Auto Co’s IT Backbone which is a Multi Vendor EcoSystem. How to identify the faulty API or Software which leads to a frustrated end user experience. He shared why it is important to have a panoramic view of the end to end Customer digital journey and know in real time when the forward facing digital apps are unavailable or underperforming. Rishab Malik Co Founder Droom.in spoke about the significant research the customer does before approaching the dealership. There are many other touch points and forces beyond the dealership now, which play a big role in customer’s decision making and can thus make or break an Auto Brand. Garima Sahney Associate Partner Saikrishna & Associates spoke about the liability issues around Autonomous vehicles. She spoke how Auto industry is in transition. “Readiness towards data security, warranty & recalls with protocols and compliances is the need of the hour”, she mentioned. 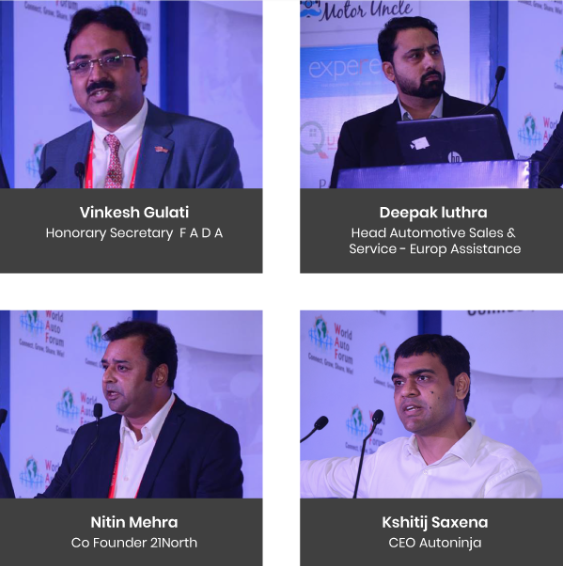 Deepak Luthra – Head Automotive Sales & Service, Europ Assistance & Nitin Mehra – Co Founder, 21North spoke about their joint Innovation VOLA – Vehicle Ownership & Lifecycle Assistance. A one stop shop desktop and mobile solution for Chauffeur & RSA Services, Vehicle Service Booking, Pick & Drop, Invoicing, PUC, Checklist, Insurance, Documentation for complete hassle free Vehicle Ownership experience. They have invested Rs 500 million in this solution. They have partnered 3000 Auto Dealers and have 2000 Drivers onboard to offer VOLA to customers. Now that’s VOILA! Kshitij Saxena Co-Founder and CEO Autoninja shared how an intelligent and intuitive data driven sales process can transform Dealer Profitability & Productivity to the next level. He shared many case studies, real life examples of Dealer Sales Operations, gamification of Competitive Sales process to engage Sales teams for Success. 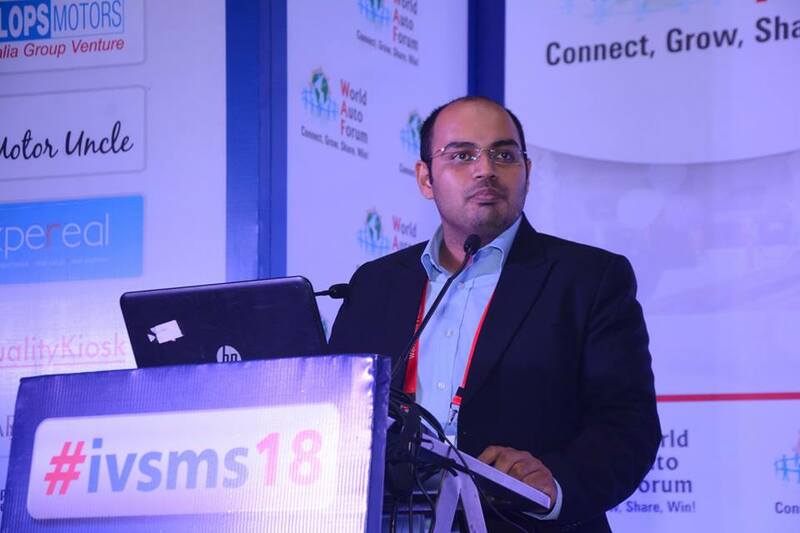 Rajesh Shewani Head Tech, Teradata spoke about the importance of all kinds of Data to power the Customer Experience and successful Operations of any company. He spoke about On Board data, External data and data reflecting consumer sentiment or voice all combining to give metrics for the right decision making. Sagar Das CEO & Co Founder Autoportal said, as per a recent study, customers are spending around 10 hours on digital, to research their next vehicle purchase. Recognising implicit customer’s buying signals is important to serve them rightly. Mobility as a service, Digitally connected Supply chains and Data Security shall be important focus areas for future. Ashish Shah CEO Delhi Dynamos FC showcased how auto brands can leverage engagement with football. Globally Football is the no. 1 sport, while at India, we are cricket heavy. Football creates high level of emotional quotient between the sport and the fans. This is where the auto company can find a connect. Dhianu Das, Co founder LuxuryRide said Luxury car Customers are extremely connected and informed, especially the young ones. Touch and feel equally important as digital. For Instance If the car doesn’t smell right, it can be rejected by customer in the luxury space. Angad Luthra CEO The Golf Foundation shared his experiences as a customer. He mentioned he is a proud BMW Customer because he connects with the brand, loves the machine, feels the joy of driving the car, doesn’t keep a driver. Self drives and takes the car everywhere. He spoke about the human connect with the brand and the machine. 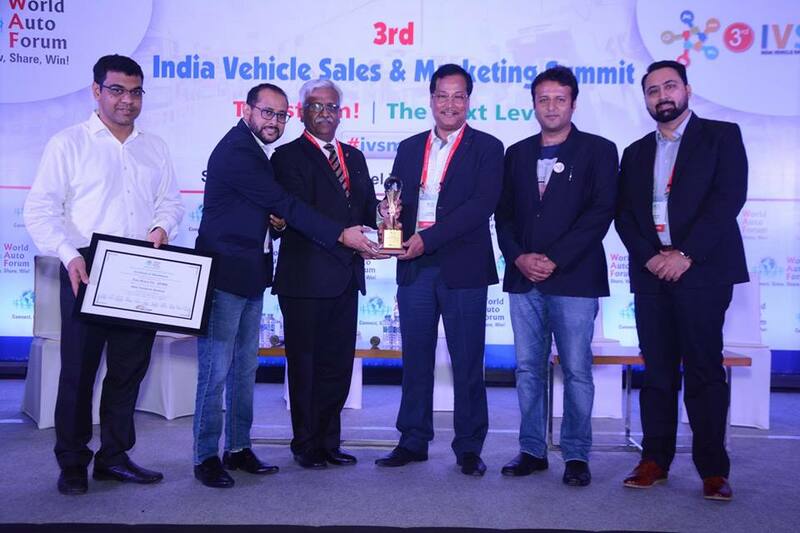 Himanshu Sukhwani CEO Cobold Digital mentioned there is tremendous scope of Digital Engagement for Auto Dealers. The OEM’s still have Digital teams, Agencies, proper media plans. The Digital content should be based on the brand and strategic intent. The Human Connect powered by Digital is an important element as most cars now get standardised. 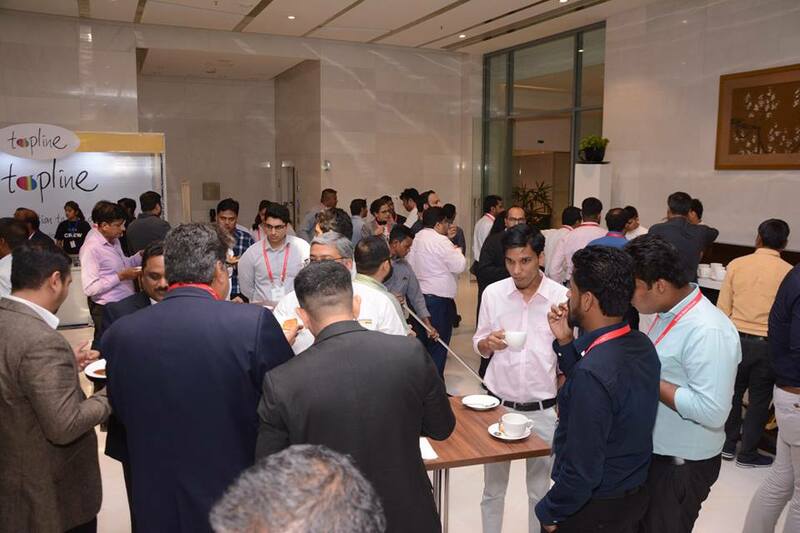 First Hybrid & Electric Vehicles Expert Network held at New Delhi.